When we told people we were spending a week on a summer family vacation with our girls -- but without our son Leo, who has high-octane autism, responses varied. The best reactions stayed positive without dwelling on the details of our abandonment: "Wow, that sounds like fun, all that time in the San Juan Islands!" More well-intentioned reactions stoked my already-raging guilt-fires: "Well, you know, those girls really deserve a break, and so do you -- it's about time you had a regular family vacation." I know those latter folks meant well, but it's amusing to me that, because of his autism, sweet-natured Leo is assumed to be the kid we need a vacation from -- when in truth it's his fiery, defiant, bickering sisters who are currently draining the parenting lifeblood from my veins. Still, I felt guilty leaving Leo behind. I kept telling myself we weren't excluding him -- he went to his beloved camp that week, so it didn't matter to him whether we stayed home or circumnavigated the globe. But we also were spending a week on his grandparents' boat. Which he loves. Loves loves loves. That seemed sneaky and uncool. Here's where the guilt-flames turn to bonfires -- we planned a completely different vacation without Leo along. Instead of spending two nights on the boat as we did with him last year, we stayed afloat nearly a week. 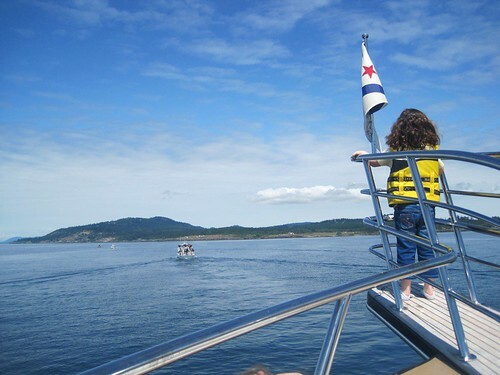 Instead of sticking to the waters near the home port in Lake Washington, we sailed through Seattle's locks, into Puget Sound, and all the way to Orcas Island. I know Leo was fine, too. Better than fine -- the camp had Jennyalice on tap should Leo need a local to help him out or come get him, plus when I came back from Seattle to pick him up, he was having so much fun that he made a stink about coming home. And I really don't think he would have enjoyed our version of a boat trip -- he's not ready for an nautical excursion of that length, plus quarters on boats are tight; they're not ideal places to soothe a homesick autistic boy out of a decibel-heavy meltdown. But taking our family to Orcas and staying on the islands themselves? Now that I've seen them, I think that might work for Leo. So we enjoyed our surreally wonderful boat trip, while I tried not to talk about how guilty I felt for leaving Leo in the Bay Area, or how worried I was about all the things that could possibly happen in our absence. We lounged at restaurants whose menus our selective eater Leo might not appreciate. Seymour and the girls took long, languid kayak trips to places where our little fish Leo might have been tempted to jump overboard. We lingered at Friday Harbor's Whale Museum, which would not have impressed Leo at all. We had a great time, enjoying our vacation for what it was, missing Leo and pointing out the things he would have liked, considering how to make the San Juans possible for him. And then, five weeks later and after BlogHer '11, we did take a full-family vacation. In San Diego, the most Leo-friendly town in California. Where we could stay with my mom (another spectacular host), and walk to the beach every day -- or twice every day. Where we know fantastic respite workers who think Leo is dreamy. Where wonderful organizations like Surfers Healing will take our boy out and show him how to ride the waves on a a longboard. Where we were happy, all five of us -- even though my husband and I were also exhausted. But it was a good exhaustion, an earned exhaustion, an enviable exhaustion. I don't feel guilty when we go on trips with Leo while his sisters are at sleepaway camps. I really need to get over that. One more area where the issues that need working through are mine, not my son's. A version of this post originally appeared at BlogHer.com. Shannon spent this past weekend fretting again as Leo went to camp and the rest of the family went to Pinnacles National Monument. Which was glorious. As was Leo's own, separate vacation.